Amerispa Le Bonne Entente and Amerispa Sheraton Laval offer you access to a complete range of medical aesthetic treatments such as IPL hair removal. Would you like permanent hair removal? Intense Pulsed Light (IPL) hair removal is a safe technique which allows long-lasting and fast results. Discover good reasons to try IPL hair removal. 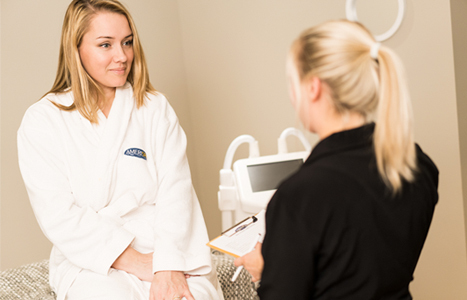 Consultation is an important step to your personalized treatment plan. Our qualified team will guide you and advise you on the medical aesthetic treatments that best suits you. It is during this consultation that you will get the required information to make a clear decision in regards to the options available to you. Details on the process of the treatment, expected results, possible side effects and precautions that need to be taken before, during and after each session will be explained to you. Furthermore, a checkup will be conducted to ensure that your medical condition does not present signs that will prevent you from receiving the selected treatment plan. Intense Pulsed Light (IPL) hair removal is a treatment which consists of eliminating body hair in a progressive and long-lasting way. It uses heat produced by the light to make hair disappear. During the session, a cold and clear gel will be applied to cool the skin and make the moment more enjoyable. The pulsed-light machine selected by Amerispa is approved by Health Canada. IPL hair removal is less painful than laser hair removal. IPL hair removal requires between 8 to 12 treatments at 4 to 8-week intervals, according to targeted areas. A slight burning, tingling or stinging sensation can be felt during a session. New hair may appear after a hormonal change (example: pregnancy or menopause), a health problem or when taking medication. In short, IPL hair removal is a safe technique which has been recognized for several years for being efficient and allows long-lasting and fast results. Medical aesthetic treatments provided at Amerispa Le Bonne Entente and Amerispa Sheraton Laval meet high quality standards. A personalised approach is favoured in order to offer you a treatment plan tailored to your needs. Take advantage of our expertise in medical aesthetic treatments! Or by phone at 1-866-263-7477.